Partie Septentrionale du Duche de Bourgogne. 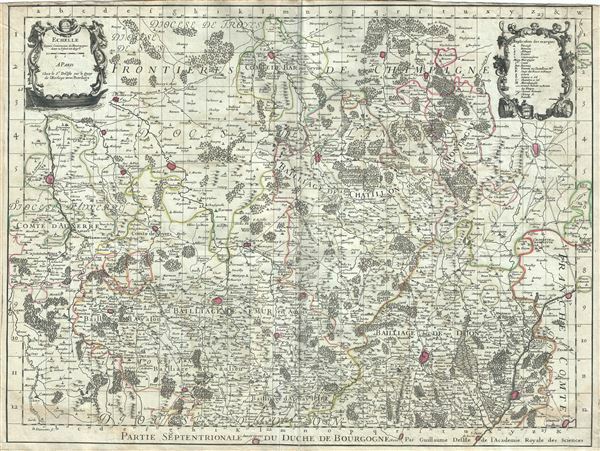 An attractive 1709 map of Burgundy (Bourgogne), France by Guillaume De L'isle. Covers the northern part of the Burgundy region of France from Bar-sur-Seine south as far as Arnay-le-Duc and from Auxerre east to Dole. The map renders the entire region in extraordinary detail offering both topographical and political information with mountains and forests beautifully rendered in profile. The region of Burgundy is famed for producing the world's finest wines. It produces what are arguably the world's finest, and most expensive Pinot noir and Chardonnay wines. The area in the western part of this map, part of the department of Yonne, is also one of only two departments that produce Chaource cheese. Chaource is a cow's milk cheese, cylindrical in shape. The central pate is soft, creamy in color, and slightly crumbly, and is surrounded by a white penicillium candidum rind. This map was created by Guillaume De L'isle in 1709. Very good. Minor wear and verso reinforcement along original centerfold. Minor spotting. Original platemark visible.